Slick, shiny patent leather is the season’s hottest material. Plain leather is just that – plain. Look for patent bags to jazz up your holiday look. No color is off limits; from winter– white, to ruby–red, to not–so–basic black; all shades of patent work well in your wardrobe. Check out some of the styles we handpicked, available in an ample range of affordable options. 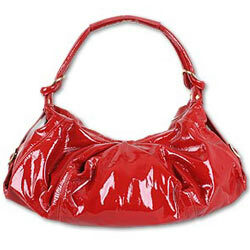 Andrea Brueckner’s legendary ruched 'Large Saddle Bag' spices up the season in a red hot patent. The slouchy yet structured hobo is both sizeable and sassy. C.C. Skye’s jewelry designs are a staple for the Hollywood set. Her handbag line incorporates her jewelry design, like this 'Ferrante Bracelet Clutch', a textured embossed alligator clutch, decked with a detachable large gold cuff and gold face plate. Rafe’s new low-priced handbag line is right on target. With all of his distinctive detailing, this faux 'Patent Clutch' in Vanilla has topstitching resembling trompe l’oeil, and is packed with signature Rafe NY hardware. 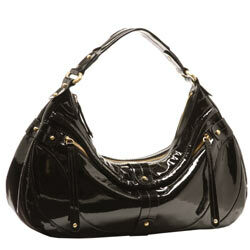 Savoy’s bestselling slouchy, studded 'Maria Luna' hobo looks well–polished in black patent. Slant pockets and dangling patent zipper pulls add a youthful touch. Newcomer Aleya NY packs a punch with the Jessie clutch. 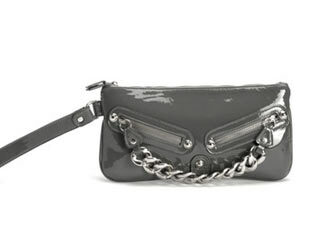 Glossy grey patent gleams endlessly with a dangling chain attached to a twin slant zippered pockets, which doubles as a strap. Kate Spade crafts a modern classic in the 'St. 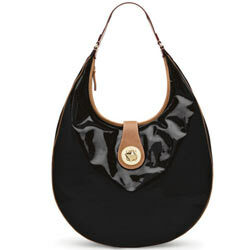 Germain Blue' hobo - a surprising black patent and brown cowhide duo, with a central gold pyramid turn–lock closure.